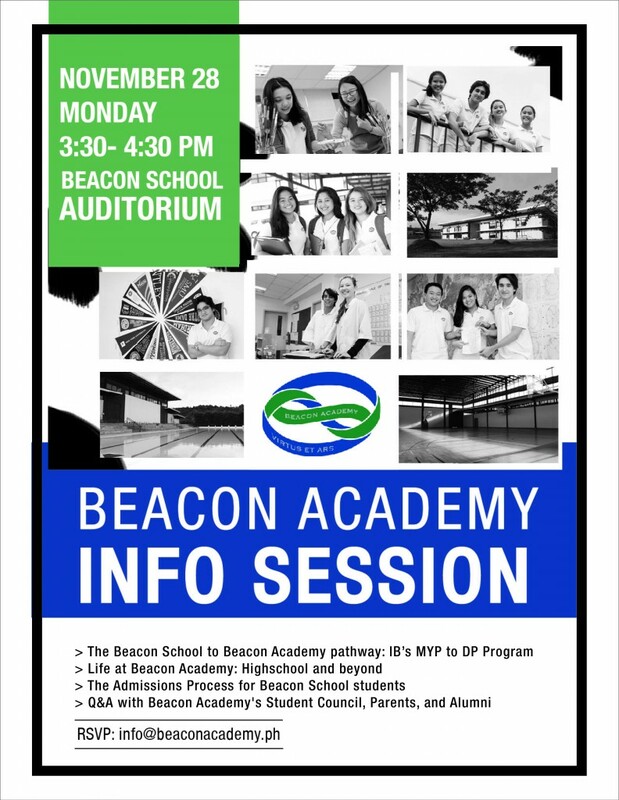 On November 28, Monday, members of the Beacon Academy together with our Student Council will be giving a brief talk about the Academy’s vision, curriculum and facilities. This talk will be taking place from 3:30PM-4:30PM at the Beacon School Auditorium in Taguig and will be spearheaded by the Beacon Academy’s Head of School Mark Vincent Escaler. There will also be a panel discussion with Beacon Academy students, alumni, and parents. We are opening this talk to all interested parents, students, and friends of the Beacon community, especially those currently in Grades 6-8. Please feel free to share this invitation your friends and family and invite them to RSVP by writing info@beaconacademy.ph.